I had my modified barium swallow last week, and that went well. It showed that the paralyzed vocal cord is affecting my swallowing, but not terribly. I've been paying closer attention to how I swallow and when it causes me to choke, and I've noticed that it nearly always happens when my head is slightly tilted back — for example, when I drink out of a bottle, or when we eat out at a restaurant that has TVs along the ceiling and I tilt my head back to watch one while swallowing. So long as I take small sips and remember to tuck my chin when swallowing, as directed by the speech therapist in the hospital, I don't have trouble very often. I now have an appointment for Thursday to actually begin speech therapy. I'm rather excited in an odd way about this. My doctor told me not to expect much voice improvement, but rather we'd probably focus on compensating techniques. He had said previously that vocal cords can sometimes recover spontaneously, but that it's less likely when the vocal cord is actually paralyzed rather than just paresed (weakened). He said today that if the vocal cord paralysis doesn't spontaneously recover within a year or so, we can consider surgical remedies, but that these won't completely restore my voice. So I really do need to accept the strong possibility that my voice will be impaired forever. I also had some bloodwork done to be sure the remaining half of my thyroid is functioning correctly, and it's doing just fine. Most people can get along easily with half a thyroid, but you need periodic testing to be sure. I won't need a recheck on this until next year now. I'm about halfway finished with my afghan, and I just love how it's turning out. The colors I selected are perfect. I want to keep this one for myself, but it's a gift, so drat! 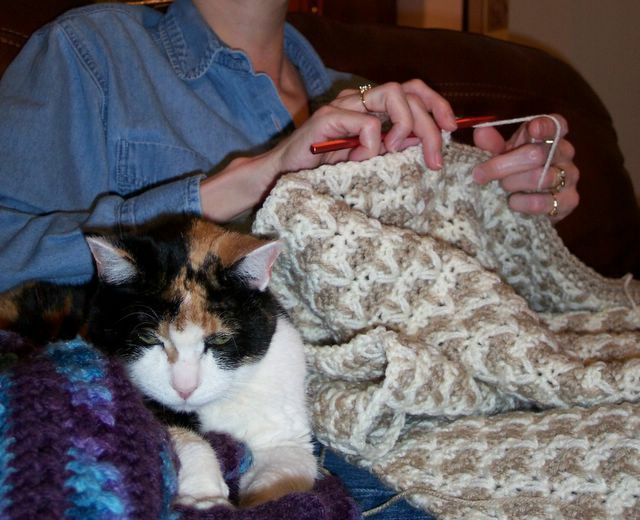 Here you can see Rika helping me crochet. Brigid has been accepted into the Center for Talent Development's summer program at Northwestern University. She attended one session last summer, where she took a full year of AP physics in three weeks. She loved it so much that she begged to go to both sessions this summer. She's going to take Latin during the first session and AP calculus during the second session. Again, a full year of study in just three weeks each session. Brigid has to leave campus for the weekend between sessions, so this means Ron and I will have to make three trips to Chicago this summer. Man, I hate it when that happens! Chicago is just far enough away that we'll have to stay two nights each trip. We'll probably add a few days to one or two of the trips, though. I love Chicago — the shopping, the restaurants, the Art Institute, the Cubs, just walking around!